Congratulations to Fernando Alonso. Triple world champion, matching greats such as Ayrton Senna and Sir Jackie Stewart. Those are the words that will be proclaimed come season’s end after another measured performance allowed him to gain ground on most of his major rivals. I think it’s fair to say that the Marina Bay circuit is not the best track for encouraging aggressive racing, they even have a corner designed specifically so cars don’t run side by side through it, but in it’s short five year history, it has absolutely captured the heart of the Formula One. Yesterday was another example of this. A slow burner of a Grand Prix was still captivating, partly due to some great racing in the midfield, but also because of the atmosphere of the occasion. Two races ago, I said that Nico Hülkenberg had the edge in the driver market over his teammate. 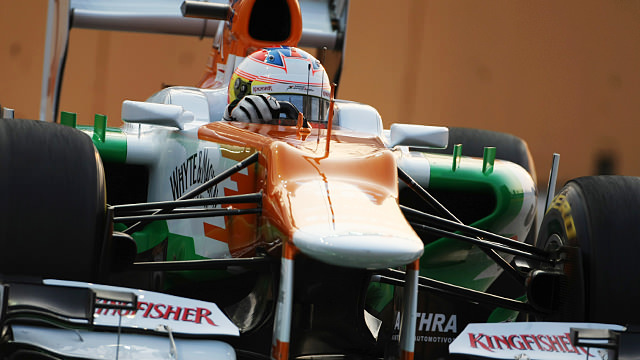 Paul di Resta didn’t have a marquee result that would make the top tier of F1 stand up and take notice. After Singapore, that’s no longer the case. And while I’m not ready to apply the ‘next big thing’ tag to him, it was a result that shows he could quite easily handle a Mercedes or Ferrari drive next year. It may just be me, but yesterday seemed like the first time that Di Resta was allowed to extract the maximum from his car. He always seems to be on a strategy that forces him to conserve tyres or his car. Yesterday, it was a different story and we got a glimpse that the Scot is a flying Scot when he is given the tools to do so; I’ve never seen him have pace like that in a year and a half of F1. Like when Hülkenberg stepped up to the plate in Belgium, it was a case of what might have been for Force India, in a weekend where anything that could go wrong for Nico did. He was cost a shot at Q3 by poor team strategy, leaving him five places back on the grid, when he could have been right up alongside Di Resta. This put him back in the pack and stopped him utilising the car's pace. To add insult to injury, after the poor qualifying, he started on the soft tyres and did a long first stint, a strategy that was completely ruined by the timing of the safety car. I’m sure that Paul feels a bit of gratitude after a complete KERS failure cost him a potential top five finish in Spa. I’m not trying to take anything away from Paul di Resta on a weekend when he was clearly on it and got the result that he deserved. However, circumstances made it look like he clearly outperformed his teammate, when the German also had very good pace, setting the fastest lap of the race. Nonetheless, with a decision on Michael Schumacher expected in the very near future, he may well have provided the perfect resume for Mercedes. I don’t usually comment on the men at the bottom of the results but I think Pastor Maldonado deserves credit for his weekend’s work. I don’t know what he or the team have done but it’s worked. He showed all of his pace and never came anywhere near crashing at the weekend. He really did deserve to score points to silence his many critics. The Venezuelan put in a truly stunning qualifying lap that came from absolutely nowhere and was running strongly until the racing Gods decided he would have to wait a little longer to score his first points since his Spanish GP win. First, he was another man who was caught out by the safety car, having pitted a couple of laps earlier, which dropped him from fourth to tenth. Then came the final blow, as his team radioed him telling him they had to retire under the second safety car. I dread to think what Spanish words were being uttered under his crash helmet at that moment. Perhaps an overlooked result of the weekend was Timo Glock’s drive to 12th. Yes, he was aided by the six retirements but each of the small teams know the importance of a big weekend at high attrition races such as Monaco and Singapore. 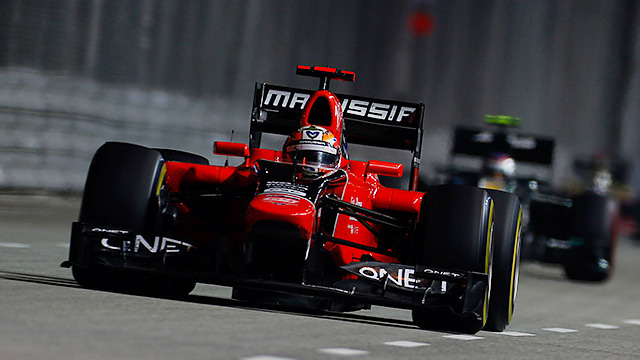 Marussia usually lose out on such occasions, evidenced by them finishing twelfth in the championship in 2010 and 2011. But Glock did all he could in a tricky evening, beating some big names to finish twelfth and take Marussia ahead of Caterham in the constructors’ championship. As well as being best of the new teams, he finished ahead of Kamui Kobayashi and Nico Hülkenberg and less than a lap down too (albeit with the aid of a safety car and a long lap) but nonetheless it goes down as Marussia’s best ever result and Glock fighting off the charge of Kobayashi and Hülkenberg without KERS in the late stages is nothing to be sniffed at. Finally to Daniel Ricciardo who scored his second points finish in three races, holding off mentor Mark Webber in the latter stages in another impressive display. Despite the fact that he is still 18th in the standings, two points behind teammate Jean-Éric Vergne, he is starting to string together some really impressive performances and it’ll be interesting to see what he can do in a competitive car, but will Toro Rosso be able to offer him this after the dog they’ve engineered this year. Ninth place represents a good effort for the youngster, even if he was aided by retirements, and it has to be said that Vergne was right with him until Michael Schumacher rather rudely rammed into the back of him. Still I think he will have enjoyed the conversation with Webber after the race where he beat him on true pace. Is the student now good enough to replace the teacher? It’s official: we are now into the thoroughly busy rush to the end of the season. From now on it’s back to back races in the early hours of the morning, giving the teams little time to develop and the fans very few lie-ins. Despite the lack of sleep that this causes, we all love it. I only hope that the McLaren’s, Red Bulls and Kimi Räikkönen stop tripping over each other and start stepping it up because at the moment they are making it easy for Señor Alonso in his prancing horse, and no one likes those end of season races when the championship isn’t on the line.